Are you looking for travel gift ideas for someone who loves to travel? One of the most important thing my family travels with are wireless headphones for the whole family. 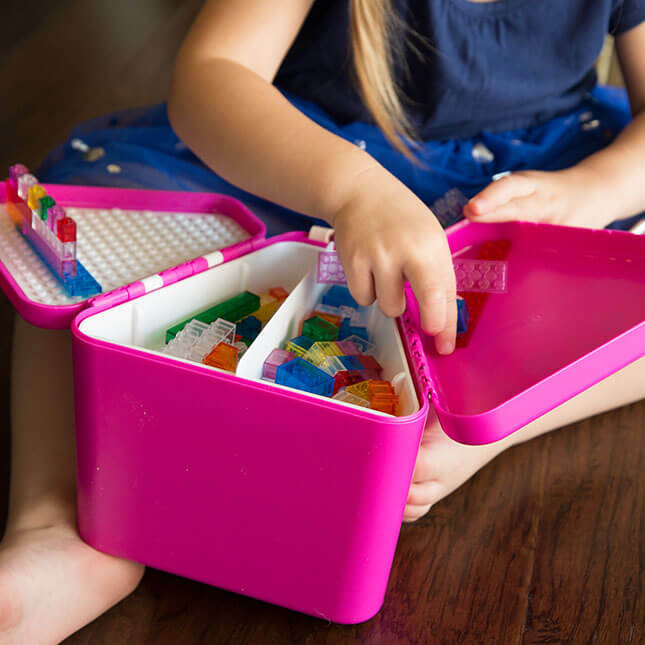 But, it can be tricky to find ones that work well for toddlers and preschoolers. I’m really glad we found these BuddyPhones for when we fly with our kids. My favorite thing is that they are super durable. My kids tends to stretch and twist things (without realizing it) when they are talking to me and it drives me bonkers! But with BuddyPhones, I don’t have to worry about them breaking it. Plus, with their kid-safe volume setting, I know I’m helping to protect their hearing. I also like that they come in a variety of colors/prints because it makes them a lot easier to find in my carry on full of electronics. I mean, how is all my stuff silver?!? My family loves toys that can be used to build or create something unique. 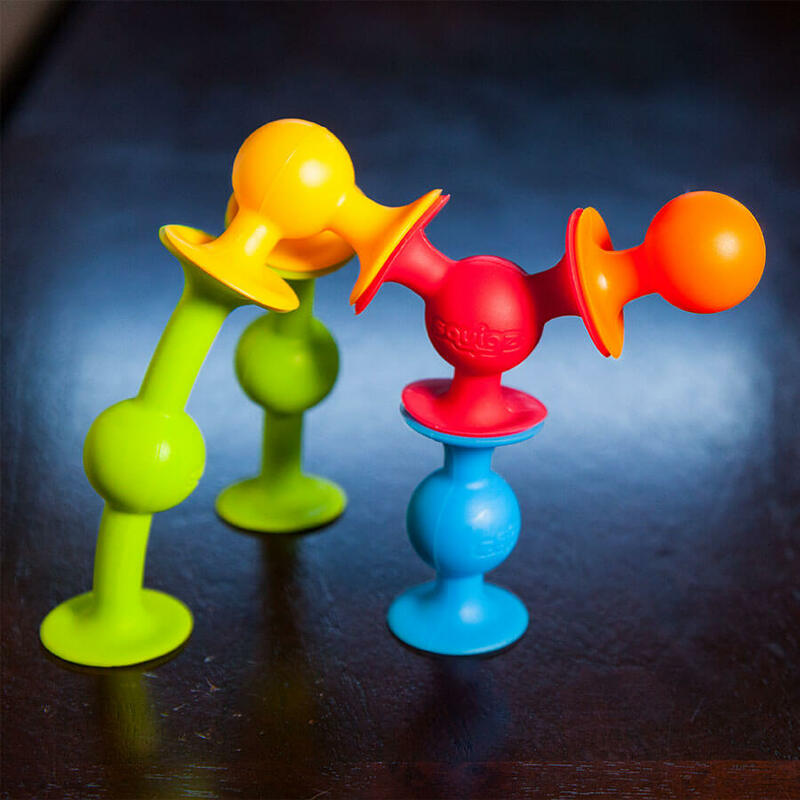 I’m a HUGE fan of Fat Brain Toys and one of our favorite products right now are their Squigz suction cupped toys. There’s something about suction cups that keep my kids occupied for hours! They come in a plastic tub, but we usually pack them in a Ziploc freezer bag when we travel. 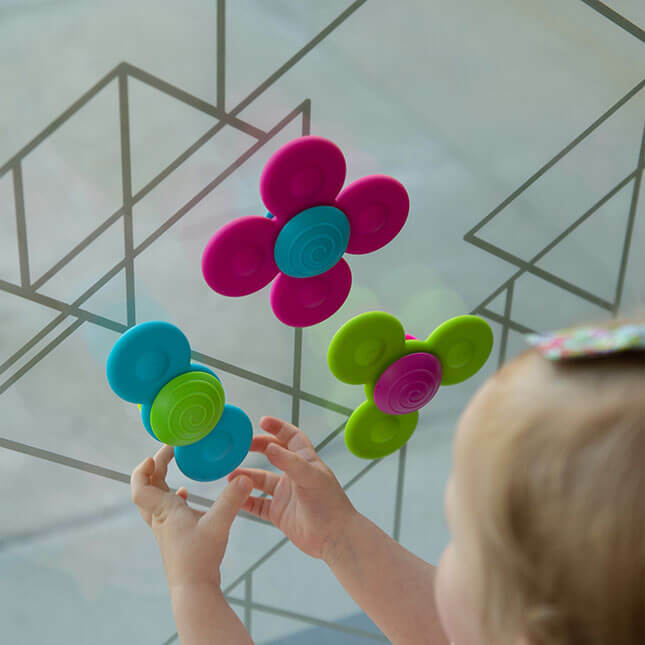 The kids play with them on airplanes (the windows and screens work well!) They also stick them on car windows when we’re on short road trips. But they get the most use out of them while we’re at the hotel. It’s a great way to keep them focused while my husband and I get ready for our adventures! Plus, they have more sets and expansions you can purchase for even more creativity! series of board books because Greg Pizzoli does such a great job with the illustrations! So, when he came out with a game, our family snapped one up! It’s like a cuter version of the classic game of Memory. We like to play it at home and talk about the different images. We also use the cards to play Go Fish. And sometimes my toddler likes to line them up to make a train! 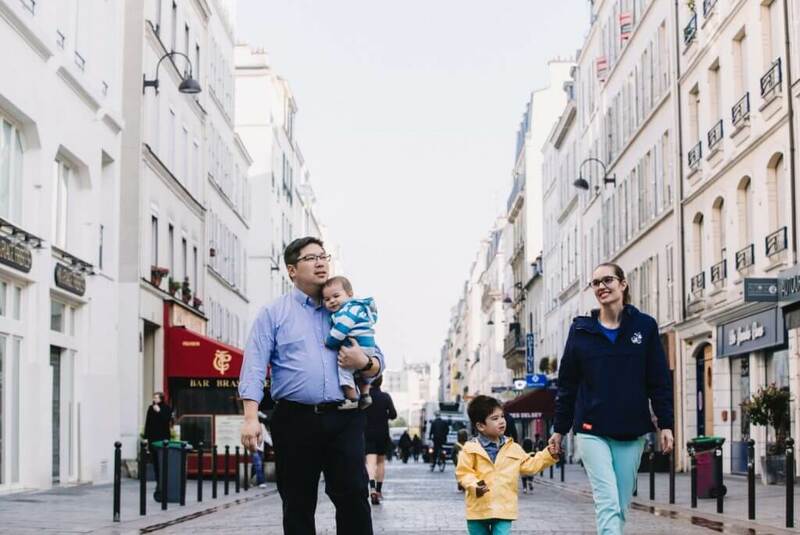 READ Take a Toddler's Tour of San Francisco, Paris, New York and London with My Little Cities! 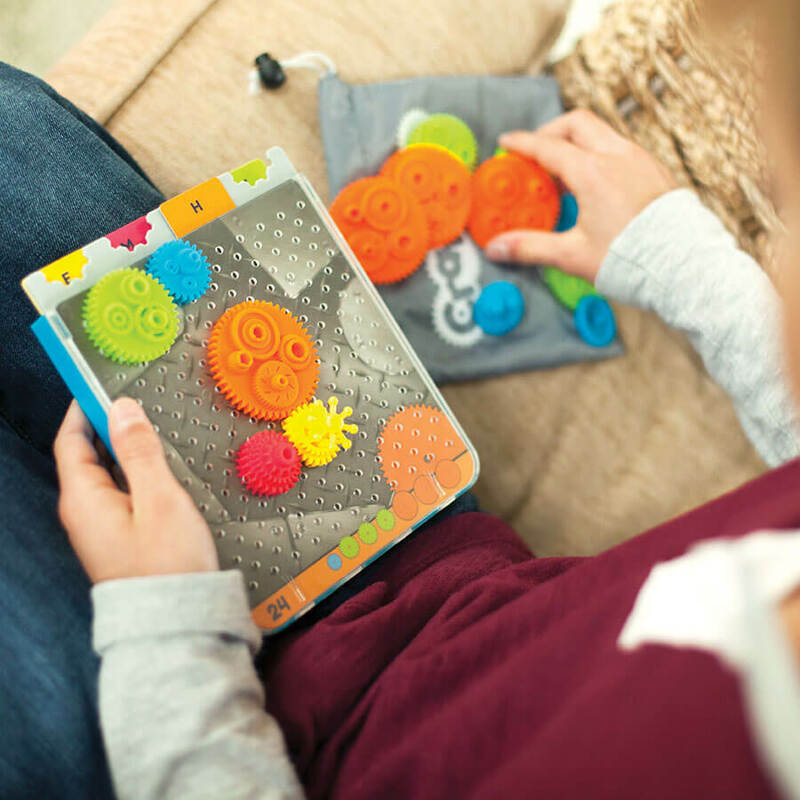 If you are looking for a great road trip toy, this Magnetic Creation Station is awesome! It’s easy to keep in the car and bring it out when your kids need something quiet to do. Since they are magnetic, the pieces usually stay right in the carrying case. 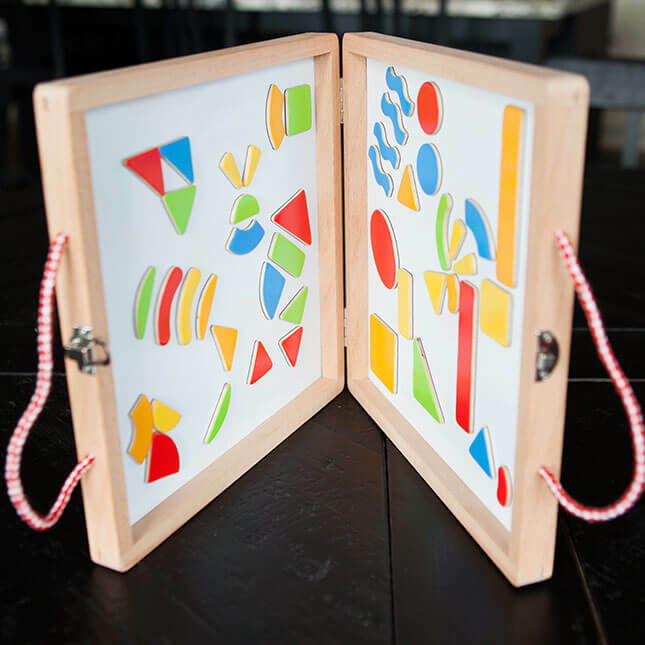 It comes with a little booklet of designs and kids can try to re-create them on their own. My (almost) 5 year old had no problem replicating the designs. And once he mastered those, he moved on to creating his own. My 2 year old also liked playing around with the magnets, but he mostly liked walking around with his “briefcase” and opening and closing it. That’s fine with me because I know he’ll get several years of use out of it! I also like that you can use different magnets to switch it up. We have a bag of numbers and letters that I’m going to add in on our next trip! 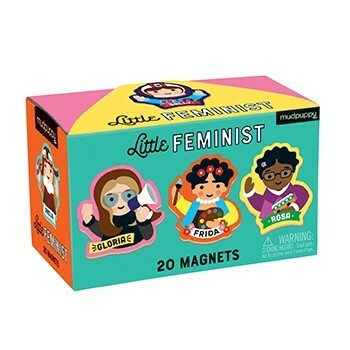 Speaking of magnets, how adorable are these Little Feminist magnets? They feature amazing women, including Marie Curie, Frida Kahlo, Sally Ride, Rosa Parks, Amelia Earhart, Ella Fitzgerald, and the list goes on and on. While they are great for kids, they would also make a great gift for teens and adults to use as a regular magnet. What a fun way to dress up a dorm room, first apartment, or cubicle! Our local airport (SeaTac in Seattle) just announced they will be allowing guests to come visit the airport. We are super excited to maybe plan a play date there so we can explore without rushing off to catch a flight! But, in the meantime, we’re going to thumb through our copy of How Airports Work. It’s from Lonely Planet Kids and we know they know their stuff! With my 2 year old, we basically just point out the airplanes and talk about what each one is doing. This one is taking off. This one is landing. But with my (almost) 5 year old, this book has the answers to just about every question he has about airports! It’s so comprehensive! Because there’s so much information, it’s a book that can really grow with kids. So, when I saw that Mudpuppy has magnetic puzzles, I knew a little boy that would love to test them out! This Space Adventure set features 2 puzzles in a cool little book/storage folder that’s completely magnetic. There are puzzles on the two ends with a nice space in the middle to put the pieces. This puzzle set would be ideal for car rides. I mean, how realistically can your kids do puzzles in the car without pieces falling all over the place? If you are traveling with babies or toddlers, it can be hard to keep them entertained. My toddler is currently obsessed with these Whirly Squigz toys from Fat Brain Toys! They are kind of like big fidget spinners that suction cup onto smooth surfaces. We like to stick them on door frames or sliding glass windows in hotel rooms. Actually, both my boys spend a lot of time spinning them! It’s kind of addictive! I think you could probably suction cup them onto airplane windows too. Or the big windows at airports. I’m a huge fan of interactive books. And the Colosseum is one of the most impressive “ancient wonder” I’ve ever seen. This is probably one of the coolest “life the flap” books I’ve seen for older kiddos. It’s fascinating to see what some of the ruins used to look like. And personally, I’m excited that they aren’t just European spots. I think too many books focus solely on Ancient Rome, Egypt or Athens. Leave it to Lonely Planet Kids to also feature China, Mexico, Peru, Cambodia, and Easter Island! I have great memories of playing games with my brother when I was growing up. We had a cupboard full of board games and card games. So, I’m a bit embarrassed that we don’t really have any games for our kids. When we have done weekend trips to places like Semiahmoo Resort & Spa and the Inn at Cape Kiwanda, their game rooms have always been a fun place to hang out. When I saw this cool transportation-themed Big Box of Games from Mudpuppy, I thought this would be the perfect way to start our own game cupboard. This box has Memory Match, Dominoes, a Spinner Game, and Bingo. Everything is made out of thick cardboard and it’s easy to pack. 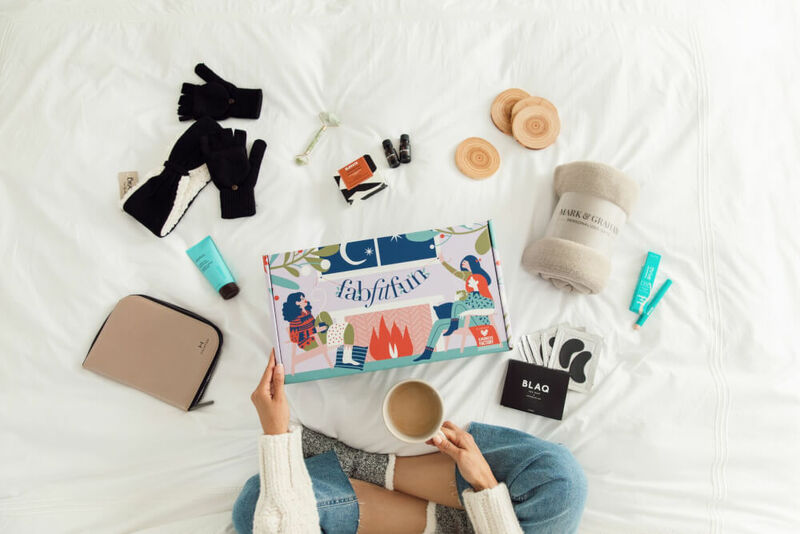 We’re packing this box on our next Fall weekend getaway in the PNW in case we need a fun rainy day activity! Do your kids insist on bringing LEGOs into the car only to drop them on the floor? Is it just my boys? We’ve tried using plastic containers, but they usually slip off my son’s lap and then there’s crying about LEGOs. So, that’s why I’m pretty excited about this Teebee box. It’s perfect for car trips of any length. You can store LEGOs inside it and there are little LEGO plates where kids can build on the Teebee box. But, it can also be used for all kinds of toys or crafts where having a surface in the car would be nice. It fits in between kids’ legs and the lid opens up in a couple directions. We’ve tested it out a lot in the car and so far it seems pretty sturdy and doesn’t move around while I’m driving. It comes with some stickers so kids can add a face. But you can also covered it with other fun stickers to personalize it! So, neither of my boys have been big on stuffed animals. But, when we received these horses in the mail, their faces lit up and they both immediately snuggled with them! Let me tell you, they are by far the softest stuffed animals we own. I was excited about them because they come with an app that helps kids learn other languages. What’s extra cool about them is that each one comes with a special code. After you download the app, you can enter the code, pick if your horse is a boy or girl, and then find out its official name! Of course, kids can also choose a nickname for their horse. That’s when we told them about the app. It starts off in English and they just launched French earlier this week! The app is all about getting kids moving while learning vocabulary. Both my boys think it’s super fun! You can pick the color of the horse and the print of their saddle. And did I mention how SOFT the horses are? If your child likes spinning gears, Crankity from Fat Brain Toys is pretty awesome! There’s a bag of gears and kids can place on the board to create little machines. For younger kids, they can play with the different gears and put them anywhere they want. However, for kids and adults up for a challenge, insert one of the 40 puzzle cards to see if you can solve. It will show you where to place the start and end gears. And it will tell you how many gears you’ll need to connect them to make the machine move. This is a nice set to take on airplanes or in the car. I like to store the whole set in a Ziploc freezer bag just so we don’t lose any of the puzzle sheets. We’ve been collecting train sets since my oldest was 18 months old. We have a lot of trains, tracks, accessories, etc. But, when I saw this train station from Lakeshore Learning, I just couldn’t help myself! I’m a sucker for wooden toys and this whole set is made of wood. My kids love that they can bring additional tracks to expand the set. And they like to bring their favorite wooden trains, too. I also think it’s neat that the carrying case transforms into the train station and trains can go through a little tunnel inside! We brought this on a recent road trip to the Oregon Coast and the kids had a lot of fun playing with it at the hotel while we took a break! I’m obsessed with travel-related children’s books. I feel like it’s the easiest way to get kids excited about the world around us. is like no other book we own. It’s created by artist Marc Martin and it combines beautiful illustrations with interesting facts. Like, did you know “Hong Kong” translates to “fragrant harbor” in Chinese? Or that Paris gets 10 tons of dog droppings each day? These facts spark a lot of interesting conversations with my kids about what life is like for people in different parts of the world. It focuses on some of the top world cities and I feel like any of the pages would look beautiful mounted on a wall! Plus, my kids love rubbing their hands across the embossed cover! We’ve actually had this set for about a year. I set it aside to use as an airplane activity, but didn’t end up needing it. My kids found it while we were cleaning and it’s been such a fun way for the kids to play! They like to pretend to be airplane pilots or people going on an adventure. This set makes for cool props to use in their imaginative play. from my youngest’s travel-themed birthday party to the set, too. We’ve been reading this to our toddler and preschooler almost every day for the past 2 weeks. I have two boys and anything with the word “poop” in it is hilarious to them. But, this book is so much more than a cheap laugh. It’s written by two comedians and their writing style makes it so parents won’t mind reading it over and over (and over and over) again. Plus, I really like the message in this book. It’s all about changing your attitude when something bad happens and continuing on with your life. I think it’s a message we all need to hear from time to time! If your kids are traveling and miss their friends at home, these Toymail Talkies are a fun way to send voice messages! Each toy has a box inside that adults can hook up to WiFi. Download the app and pair it with the Talkie. Now, kids can record (and receive) voice messages all on their own. And the helpful thing is that all messages go to the adult’s phone first so they can approve messages to pass along to their child. My (almost) 5 year old feels very grown up being able to send messages to his parents and grandparents on his own! Plus, his whole face lights up when someone messages him back! It’s also a nice way to stay connected when parents are traveling without their kids. Are you always cold in hotel rooms like I am? My husband is always hot, so we always seem to have the A/C on and I end up snuggled in bed every time we get to the room. What’s cool about rev’pod™ is that it’s a wearable blanket. It’s basically the softest, coziest blanket that you can wear like a sleep sack or a cardigan. It’s mostly marketed as a clean blanket you can use on the airplane. You can throw it in your carry on and then put it on during your flight to stay nice and warm. It’s stretchy, so you could even probably wear a baby in a carrier underneath and zip you both in. Or snuggle with a tired toddler. Then, you can snap up the ends and wear it through the airport! Oh, and you can even get it monogrammed! When my husband and I went to NYC earlier this year, we did a Museum Hack Tour of The Met and it was hilarious, informative, and one of the coolest museum experiences we’d had. So, when I heard they were writing a book, I knew I had to get my hands on a copy! It’s all about highlighting famous and not-so-famous women who changed history. And they do it in a funny, conversational style so it feels like a girlfriend is telling you salacious gossip about a celebrity! If you liked Jon Stewart’s America book, you’ll LOVE this one. It’s talking about history in a way that’s engaging and will leave you feeling empowered and ready to make your mark on the world! It makes a great holiday gift or a cool gift to give at the Women’s March. Plus, it was just released, so you’ll be the hip sister/aunt/daughter/mother/bestie to give this as a gift! If your family likes to hang out at the beach or play outside as much as our family, you’ll want to check out this Sandlite Sand-Free Mat. It’s designed so sand will sift through the top layer, but won’t allow sand to come up through the bottom layer. So you won’t have to sit on a sandy blanket or tell your kids to keep their sandy feet off it. What’s also cool about this mat is that it’s also water-resistant to spills. Like, if you kid spills their juice box, it will just bead on the mat instead of soaking through or staining it. Sandlite also makes a line of bags with the same technology that keeps the inside of the bag clear of crumbs, sand, dirt, etc. If you aren’t bringing a stroller, the Lugabug is a great option to let kids sit while you wheel them around. Plus, it’s lightweight and folds up compactly so it’s easy to store when you aren’t using it. While this isn’t technically a gift FOR Mom, it will be something she’d like if she has a baby and wants to sleep on vacation! Our family loves SwaddleDesigns! They are a Seattle company that makes some of the cutest and most functional baby products. Their latest sleep sack is genius! Our kids loved being swaddled from age 0-4 months, but as soon as they busted out of the swaddle, we had a hard time finding a good transition. That’s where this Swaddle Sack comes in. The sleeves will keep your baby nice and warm and it’s perfect for babies who like to sleep with their arms up. There’s nothing worse than trying to soothe a tired baby in a hotel room on vacation. Set yourself up for success with the right sleep sack! I wouldn’t consider myself a “trendy” person, but I definitely feel glamorous when I open my FabFitFun box. It’s filled with beauty/lifestyle products that I’ve mostly never heard of. But, what’s cool about it is that they are all “giftable” items. I like to grab out my favorite items and the rest make nice gifts for friends and family for any occasion. 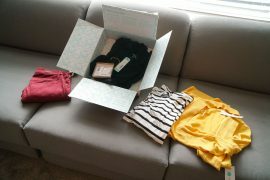 It’s like having a box of instant hostess/birthday gifts that are unique and always on trend! And for me, that alleviates a lot of stress of last minute shopping! Use code SANTABABY here for $10 off! My husband has been obsessed with Hydro Flask all year! He read an article about how the company mailed a Hydro Flask full of ice to someone and it was still full of ice when it arrived. This impressed him to no end! We’ve taken our Hydro Flask water bottle traveling locally around Seattle and it’s been great. However, the real test was when we brought it to LEGOLAND California last month. We saved so much money refilling the Hydro Flask with ice water and it stayed ice cold all day long. that keeps hot drinks piping hot! Like, you can pack hot coffee in the morning and enjoy it several hours later! In our home, we are HUGE fans of building bricks. What’s cool about Nanoblocks is that they are smaller than LEGOs. This set has more than 1,400 blocks! That means this sets take up less space without losing any of the detail! We are in love with this New York set because it reminds us of our awesome trip there last May! It features famous sites like the Statue of Liberty, Central Park, the 9/11 Memorial, the Empire State Building, the Brooklyn Bridge, and more! This is a fun gift for parents who want a challenging project to test their building skills! Plus it’s a fun project for the whole family to work on over Winter Break! I love to give people experiences where they can learn something new. That’s why I love Go City Cards. They offer discounted rates on popular tourist attractions in major U.S. and international cities. This is an awesome gift for someone heading to one of the following locations. Click to learn about the specific deals. The Go Cards are a great way to save money on top activities and attractions while traveling, especially with kids! One of my favorite experiential gifts is a photo shoot from Flytographer! It’s a service where you can book a photographer almost anywhere in the world. It’s great because it’s all in English (even if you are booking a photo shoot in Paris) and you can select the photographers you would like to work with. So far, we’ve used them in Paris, Maui, and in New York City. Each time, our photographer gives us insider tips on where to eat, secret photo spots, and we always feel like we’ve made a friend. I highly recommend giving a Flytographer photoshoot as a gift or requesting one for yourself! Finally, for the family who loves having fun together, you might consider splurging for tickets to Disneyland, Universal Studios, LEGOLAND, Knott’s Berry Farm, Walt Disney World, etc. And if you know someone is going to Disneyland, you can get them Disney Character Dining! 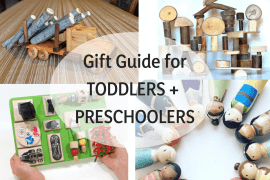 Thanks to the Holiday Gift Guide sponsors who sent products for this guide. All opinions are my own and my family truly enjoys each of these products. I love all of these ideas! 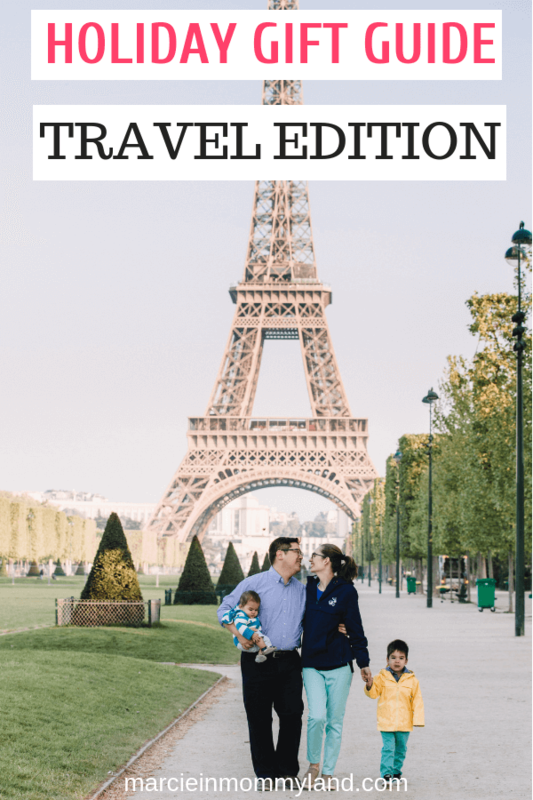 My family have been traveling a lot more than I thought so this would be great for my kids! It’s always nice to have a good distraction for them! Oh I love these ideas! The toys are amazing, even I would have fun with them bored on a flight or car ride. Wow, I love all these stuffs for my kids, they are all beautiful and I am sure they will like it too. Thanks! It took awhile to find everything and I’m still adding to my guide! These are some really neat toys that I haven’t seen before. My kids would like these regardless of if we were travelling or not! Thanks! I scoured the internet looking for products that are unique! Wow that is a great bunch of games you have show cased up there–something for any age! As for me-I have no children and I do not travel BUT I am always cold in my apartment–I need that REV’POD. Now that looks like it would keep me warm while sitting at my computer or in bed! Yes! It’s so soft and cozy! I’m always freezing and it’s just the right thickness! Is there a kid who doesn’t love a train set? I think every child in the world should have their own train set at some point, as it provides infinite hours of fun and boosts their imagination. Great other choices in this guide too! My kids LOVE trains! It’s so good for building skills and using their creativity! Totally putting a flytographer on my wish list! It’s been so helpful for us! 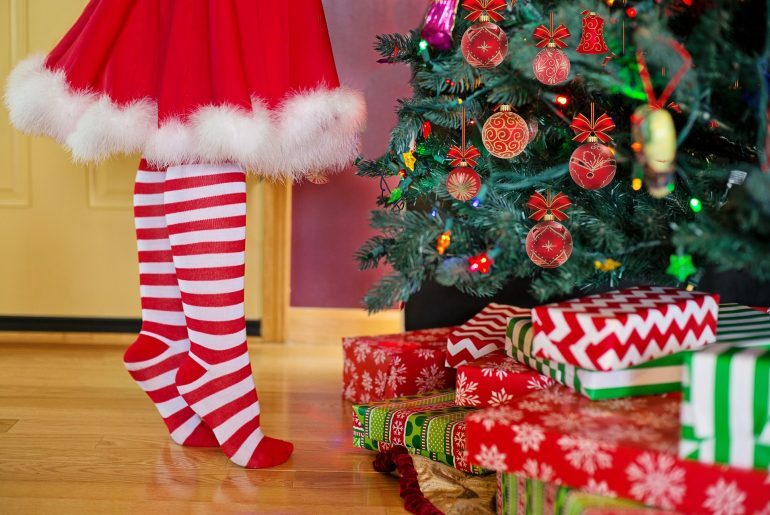 These are some wonderful gift ideas for traveling families! Those buddyphones look super cute! They come in lots of colors and prints! Traveling together with the family is so much fun. I have never been to Lego land but I always wanted to visit. Such a wonderful place. I’m hoping to go next year and this would be perfect place to start! LEGOLAND was definitely one of our favorite travel spots this year! Nanoblock New York scene is something that my husband would really love. Yes, my husband, He is a kid at heart lol. I’ll have to check this out. Oh totally! My husband is excited to build his! We are going to travel with kids on this coming holiday and I think the buddy phone is the perfect gift to give to my nephew and niece. Yes, everyone will appreciate it! I have been keen to use FLytographer but have never actually come across anyone before who has actually used it. Also I love the little feminist kit! Do it! They are so easy to work with and our photos always come out great! We have several pairs of those headphones around the house, simply because they are SO perfect for kids! Yay! My kids LOVE them! 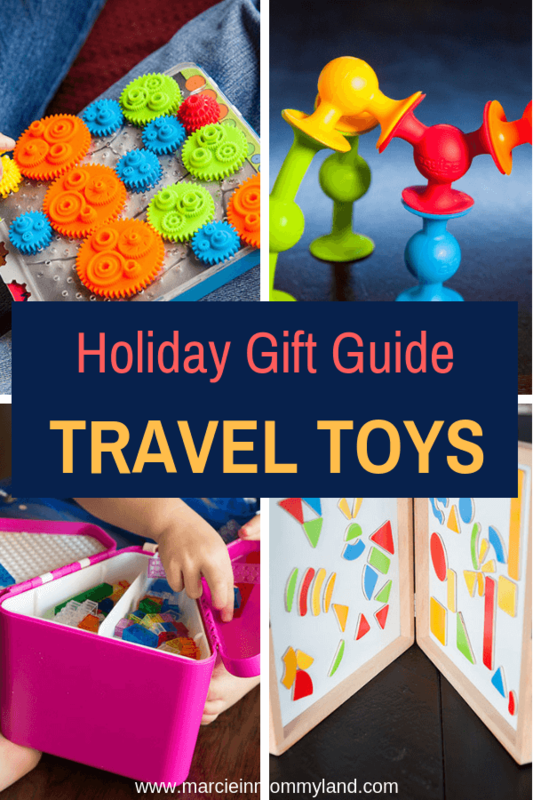 I don’t have any kids myself but these are great gift ideas to keep the little ones busy during traveling. I will keep them in mind. Yes! ME! I am a holiday gift guide junkie haha. I read them all because I never know what to get anyone so I love getting tips and feedback on products! Haha! So am I! I love seeing what other people think is cool! Yes, these are perfect additions! And what lucky kiddos! Nice! I love all these kinds of stuff for my kids, they are all very cool and I am sure they will like it too. I tried to find some unique items! I could totally see the earphones being a hit with my older three and the magnet station being a win for my younger two. We have several trips coming up with the family and need all the traveling tips/gadgets we can get! Aren’t those magnets the best? Awesome gift ideas! I really love that Ancient Wonders flip book. My 2 year old son is really into these types of books right now and I think he will love that! My boys can’t get enough of that book! I love the idea of those Buddy Phones! I have been looking for headphones for my oldest and these look great! Check them out! 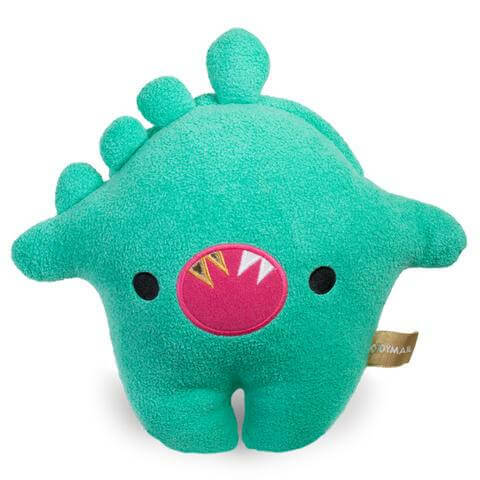 They come in so many fun colors! Our kids are pretty much grown now. Most of their toys have been moved out none . The wooden train pieces lives on in our house with all hours of memories. 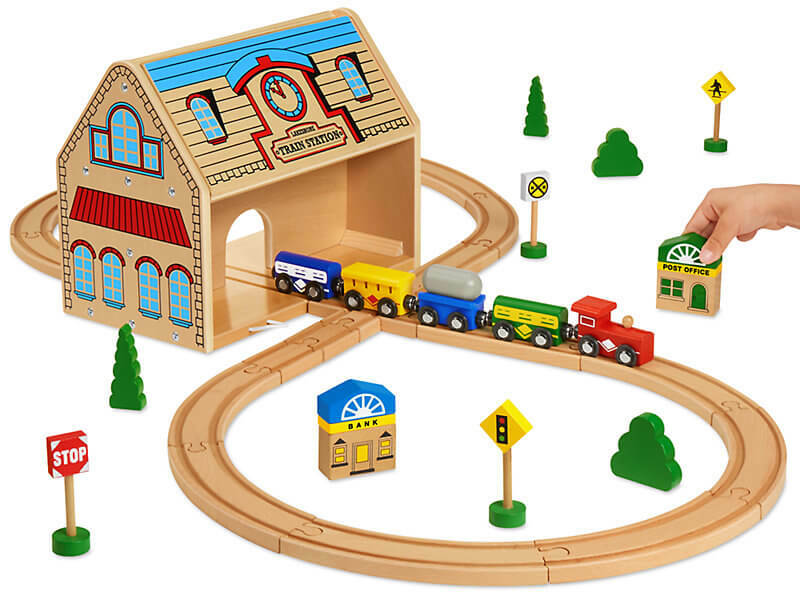 Yes, wooden trains and tracks are timeless!